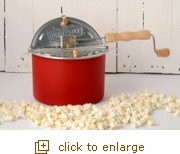 The Original Red Whirley-Pop™ makes it easier than ever to have the ultimate popcorn experience at home! Pan and lid are made out of high-quality aluminum with original nylon or die-cast metal gears and hardwood handle and knobs. Outer pan is coated with high-temperature paint. Due to aluminum construction, this version is not induction compatible. Please visit the Stainless Steel Whirley-Pop page for an induction compatible option. Consult stovetop manual for guidance on use of lightweight aluminum cookware on flat top stoves.